This Week Tuesday Night Recording Club took it back to 1982 and recorded an original song “Fall Like Rain” using the recording techniques and technologies that were originally employed to create Duran Duran’s triple – platinum “Rio” album. Many of you who know me personally can attest to the fact that I’ve always made a point of not relying on specific pieces of gear to make great recordings. Let me just say – that re-creating the “Rio” sound would be impossible without the right equipment and (of course) the right players. In 1981, the time when Duran Duran stepped into Air Studios in London to begin recording, AMS/Neve had released the world’s first full-bandwidth digital reverb unit called the “RMX16. If you w ant an idea of what it can sound like, reference Phil Collins – “In The Air Tonight” drum sound. This reverb (and its use/abuse) is greatly responsible for much of the drum sounds throughout the 80s and “Rio” is a pioneer of this trend. Eventide’s 949 and 2016 are also contributors to this “new” era of digital processing. In the case of The Rio album, it could easily be argued that The Roland Jupiter 8 takes the cake for offering top-notch polyphonic synth sounds and stellar arpeggiation control. The relentless pulsing “random-arpeggiator” in “Hungry Like The Wolf” is a classic example. We utilized a Jupiter 6 Keyboard (very similar to the 8) provided and operated by the talented Jamie Edwards to achieve that very same type of pulse in our song. 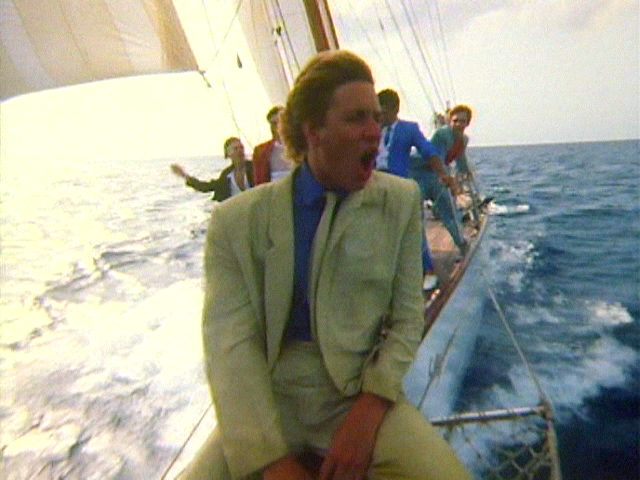 This alone screams Duran Duran. We added a Roland Juno (also arpeggiating) in the choruses to give a slight “lift” to those sections. 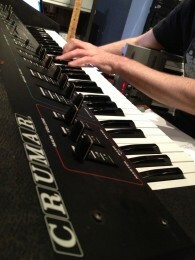 We also used a Crumar keyboard that produced a very synthy-string sound…a regular for Nick Rhodes. Although we didn’t have an actual Fairlight keyboard (few do) – famously known as the first comprehensive digital sampler/ keyboard, we did have library samples and we used them in the bridge (marimba and a breathy low sound). Having this gear at our disposal was a real treat. The acoustic drum sound on our original song “Fall Like Rain” was inspired by the sound on the song “Rio”. My original thought was to not try and emulate the sound, because it seemed a bit lack-luster to me as compared to my ideals when thinking about 80s drum sounds in general. After some critical listening, I realized that the subdued nature of the acoustic drums (mainly the snare) is what allows the percussive quality of the electronic sounds to really pop in the mix. The kick drum sound on “Rio” is severely eq’d and could easily pass as an ele ctronic sound. Frequencies between 200-400Hz were attenuated and frequencies between 4-8khz were boosted almost 6-8db. This amount of boost in the treble range can be very unforgiving to a drummer with an inconsistent kick foot…luckily; we had no such problem with our drummer Steve Chaggaris. To Achieve the snare sound we used a Pearl 6 ½ X 14” metal drum…tuned to match the pitch on “Rio”with the snares loosened up more than your usual “baggy” sound. I used part of a cotton twill shirt over the top of the head. We also used roto-toms in the bridge… originally I was thinking about using Simmons electronic drum samples like Duran Duran did…but the roto toms (slathered in gated reverb) worked really well and also represent the drum technology of the time. Achieving the Duran Duran bass sound is less about the equipment, and mostly about the playing. John Taylor idolized Bernard Edwards of “Chic” and the funky- disco style of bass playing on the Rio album is evidence of that. Annie Hoffman fell (remarkably) right into step with the style and with a little console eq and some eventide “micropitchshift”…we were in business. The guitar sounds were created using a Marshall 100watt head (with lots of gain) and 4X12 cabinet with a blend of two dynamic mics. One track had a very short analog delay with lowest feedback setting and a Boss Chorus Ensemble pedal and the other (in the chorus) was made by using an EBO (electromagnet) instead of a pick. Aaron’s vocals were recorded with a Neumann U47 tube mic and were double-tracked throughout the song. 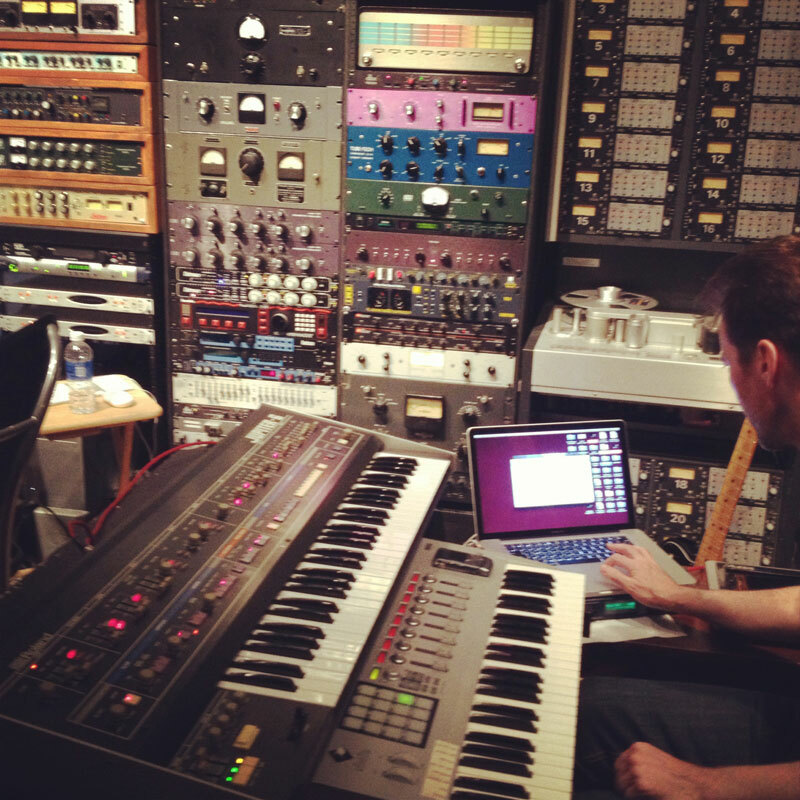 Heavy amounts of chorus and delay helped us achieve the Simon Le Bon studio sound. I gotta say…this process was super-fun to go through. Critically re-creating this sound illuminated so many details that seemed to waft over me in the past when casually listening to those recordings. I learned a lot this week. Check out our “Rio” influenced recording of “Fall Like Rain” below…download it for free if you like too. Also, check out the video that Will Claflin so skillfully shot and edited in record time. Tuesday Night Recording Club – “Fall Like Rain” from Tuesday Night Recording Club on Vimeo.